What is Professional Chemical & Green Cleaning? The federal government first defined “green” and “environmentally preferred purchasing” as “…products and services that have a lesser or reduced effect on human health and the environment when compared with competing products and services that serve the same purpose” with Executive Order 13101 in 1998. This executive order has subsequently been superseded since 2007 by Executive Order 13423, which places additional emphasis on issues of sustainability and also considers product life cycles. SoCal Janitorial Supply has a large selection of janitorial cleaning supplies and products that are sold directly to our customers at a great price. We provide a one-stop shop for residential and commercial cleaning equipment, perfect for your business, school, medical hospital, or home. Our shop is located in Santa Ana, the center of Orange County and is easily accessible by multiple freeways. 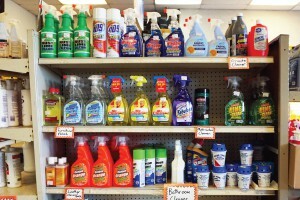 Visit our store to speak with our helpful associates to find the best cleaning products for your job. We also offer convenient and fast delivery to most areas in Orange County. If you prefer to order online, please visit our online shop 714supply.com. We have designed this website to provide you with the best selection of quality janitorial cleaning supplies available today. Review the instructions below to receive a quotation from SoCal Janitorial Supply. Click the button below to look through our huge selection of cleaning products, janitorial supplies, and janitorial equipment.